Now’s a really good time to be buying a pre-owned car. For buyers on a budget, a used model will often get you more for your money, but is it worth paying more for a pre-owned model that is “certified”? It all depends on the vehicle and the market. In case you haven’t heard, the used car market is getting oversaturated. Larger discounts on new cars mean that dealers have to slash prices on their used inventory. That’s good news for savvy consumers. Of course, a lot of car buyers can be a little apprehensive about buying a pre-owned car due to concerns about reliability and warranty coverage. This is why “certified pre-owned” (CPO) cars can be very appealing. 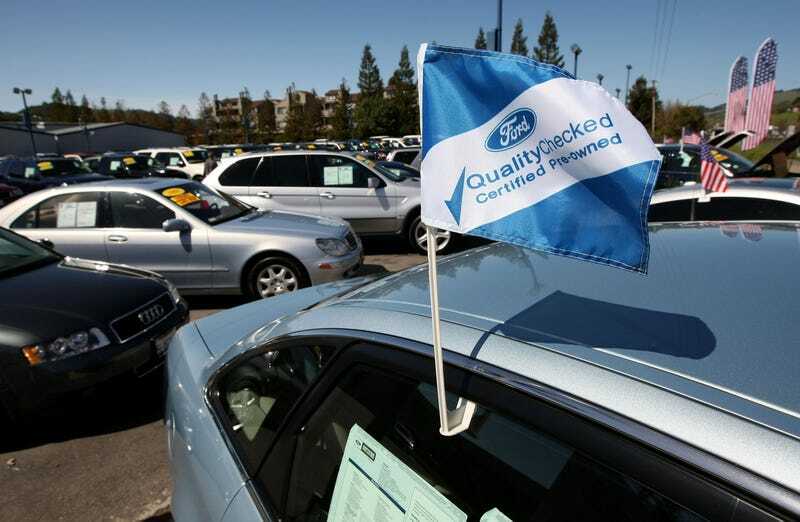 Certified cars will often carry a price premium over their non-CPO counterparts. A recent study in Automotive News indicated that millennial ca buyers were willing to pay up to $3,800 more for a certified pre-owned model. That’s a significant jump over older buyers who thought that CPO cars were only worth about $2,700 more, but it seems that a lot of buyers are willing to pay too much for the label. Before we get into the details on whether or not certified cars offer a better value proposition, it’s important to establish what “certified” actually means. There are basically two types of “certified” cars—manufacturer certified and dealer certified. A manufacturer certified car most undergo some type of standardized inspection process and if the vehicle meets a certain set of criteria the pre-owned car will get CPO status. The certified car will usually have some kind of extension of the factory warranty term. Each brand has different standards and different warranty extensions for their CPO programs, some are better than others. Buyers should do their research to see what kind of additional coverage they are going to get and for how long. In order for a dealer to put a CPO label on a pre-owned car, they have to pay the manufacturer a fee to complete this process. Often this fee is passed onto the consumer and the price of a CPO car will be listed higher than if it was not certified. What consumers should watch out for are cars that are “dealer certified” and not manufacturer certified. Dealers know that the “certified” label can justify a price increase, so the dealer will “certify” the car using their own criteria that may or may not be aligned with the manufacturer standards and the car may or may not have a warranty extension that is good at any other dealer from that brand. Should I Pay More For A CPO Car? As I mentioned above, the certified label is really all about buyer confidence. No one wants to purchase a used car—or a new one—that they have to dump a bunch of money into to keep running. A CPO model gives consumers some protection against defects and expensive repairs. However, if used car buyers pick the right vehicle, it may not be necessary to pay more for the extra coverage. Let’s say you were in the market for an affordable pre-owned sedan. A 2014 Toyota Camry SE could easily be had with low miles for around $12,000 to $13,000. Yet some dealers in the country seem to think that they can charge almost $20,000 for a similar 2014 Camry. The Camry is one of the most reliable sedans you can buy, so most buyers can lean on the build quality and probably forgo the extra cost for the certified models. The other problem with some CPO cars is when the prices are so high, it makes the used car overlap with the cost of a brand new one. In the case of the Camry, those $20,000 CPO cars that are three-years-old actually cost more than a brand new 2017 Camry SE once you factor in steep dealer discounts and rebates. An all-wheel-drive LX model retails for about $16,500, yet the lowest priced car on that list is also a Honda CPO model, that additional coverage makes it a more desirable purchase. However, where certified cars are often worth it is with used luxury models. Luxury cars tend to have higher running costs than your mainstream brands. Therefore certified models could not only offer some kind of filtering process against luxury models that didn’t meet the standard but give you a warranty buffer zone against expensive repairs. While it is advisable to invest in a certified luxury car, you still shouldn’t spend a dramatic amount more than the price of a non-certified model. In the case of a pre-owned luxury crossover like a 2014 Audi Q5, we have three examples with the same level of equipment, yet the Audi certified car with the fewest miles is only a few hundred dollars more than the cars without the CPO. The general rule of thumb is that for mainstream models that have a good reputation for reliability, the CPO isn’t worth spending more money on, but if you can get the extra coverage without any additional cost that is probably the car to buy. On the other hand, if you are concerned with the expensive maintenance associated with a used luxury car, pay a little more for a certified model, but find ones that are priced competitively.